1305 – William Wallace, one of the leaders of the Scottish Rebellion against Edward I Plantagenet, King of England, is executed for high treason by being hung, drawn and quartered. 1775 – George III Hanover, King of Great Britain, declares the American colonies exist in an ‘open and avowed state of rebellion’. 1561 – A widowed Mary I Stuart, Queen of Scotland and France, returns home to Scotland, after an absence of thirteen years. 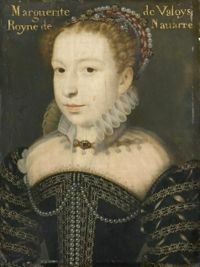 The third daughter and sixth child of Henri II de Valois, King of France, and Catherine de Medici, Countess of Auvergne, Marguerite was born on 14th May 1553 at the Château de Saint-Germain-en-Laye, Yvelines, France. Growing up at the French court, Marguerite fell in love with a local nobleman, Henri Baudemont, the future Duke of Guise; however her mother’s hatred for the entire Guise family prevented any such match from materialising. Being the daughter of the King of France, Marguerite had a number of suitors including Carlos Habsburg, the Prince of Asturias, and Sebastian I Avis, King of Portugal. Instead, as was common with princesses of her age, Marguerite’s marriage would be used to cement a political and religious alliance with a neighbouring kingdom. 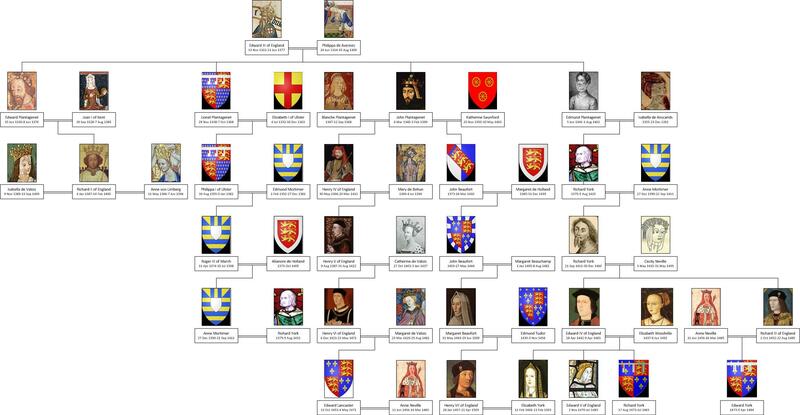 Whilst France was fiercely Catholic, neighbouring Navarre was Protestant and the marriage between its king, Henri III de Bourbon, and Marguerite was meant to ‘create harmony between Catholics and the Protestant Huguenots’. Their marriage took place on 18th August 1572 at the Cathedral of Notre Dame; however because the groom was Protestant and not Catholic, he had to remain outside the cathedral for most of the ceremony. Paris was filled with Catholics and Protestants alike, attending the celebrations of the wedding and the hope of a time of religious peace between the two factions. Alas it was not to be as a widespread massacre of the visiting Protestants swept the city and continued out into the provinces in the following days. Historians differ on the death toll, but believe it was as low as 5,000 people or as high as 30,000. This lead to the outbreak of the French Wars of Religion between the Valois of France and the Baudemont of Guise against the Bourbons of Navarre. 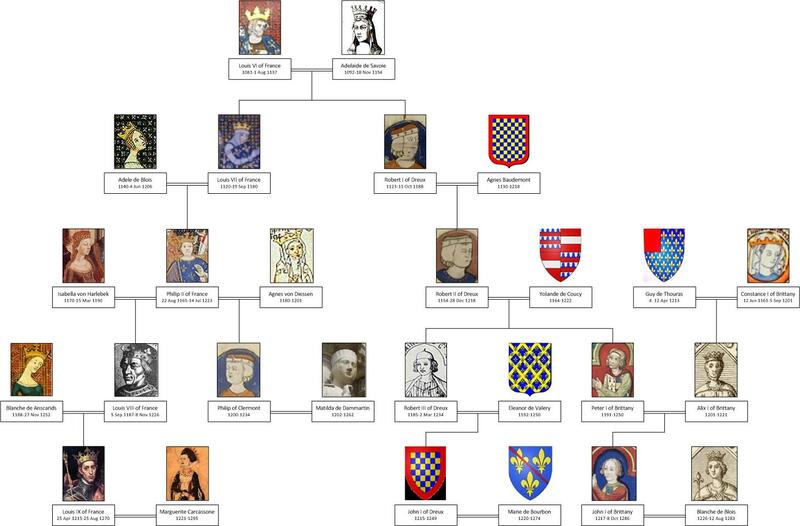 This was a precarious position to be in as until Margurite’s brother, Charles IX de Valois, managed to father a son, it was Henri of Navarre who was the heir of the throne of France. Having been captured during the riots, Henri was forced to convert to Catholicism before he was released, abelit under house arrest along with his wife. After three years of confinement, Henri managed to escape in 1576. Neither Henri nor Marguerite was faithful during their marriage, in fact they were both notoriously known for their adultery. Alas they would never have any children, but neither would any of Marguerite’s brothers; therefore when her last brother, Henri III de Valois, King of France, died on 2nd August 1589, Marguerite became the Queen of France as her husband was now Henri IV de Bourbon, King of France. With his new throne came a desire for legitimate heirs. 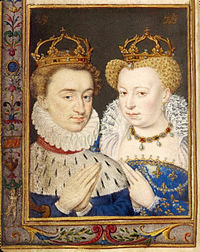 Marguerite and Henri divorced in 1599 after a marriage of 25 years, with Marguerite being allowed to keep her title of Queen. Henri IV remarried to Marie de Medici, another Florentine princess. Despite the failings of their marriage, Marguerite was allowed back at the French court where she established herself as a mentor of the arts and benefactress of the poor, helped plan events at court and nurtured the children of Henry IV and Marie. Marguerite died on 27th March 1615 and was buried in the St Denis Basilica. 1572 – Marriage of Henri III de Bourbon, King of Navarre, and Marguerite de Valois, Princess of France. The Massacre of St. Bartholomew’s would occur just days later.